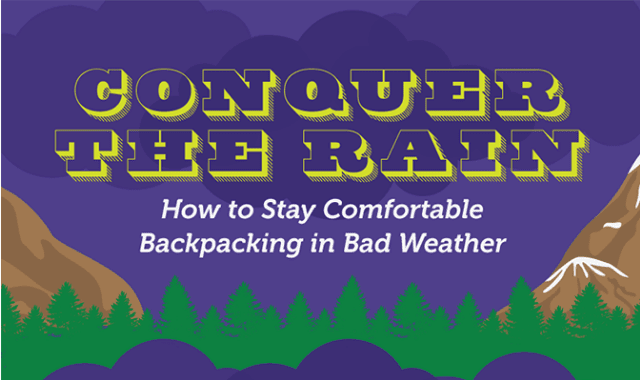 Conquer the Rain: How to Stay Comfortable Backpacking in Bad Weather #Infographic ~ Visualistan '+g+"
Many people avoid going outdoors in the rain, but backpacking in the rain can actually be really fun: the sound of rain in the trees, the cooler temperatures, and the smell of fresh water on the plants are all unique components of a rainy-day hike. The rain also keeps the bugs away and settles trail dust created by other hikers. Don’t let a rainy forecast ruin your weekend backpacking plans. Here are some tips and tricks for staying warm and dry when the weather just won't cooperate.